Insects wreak havoc on our flowers by chewing, sucking, and transmitting diseases, leaving frustrated gardeners to ponder whether to fight back with chemical pesticides, organic poultices, or angry machete chops. However, even if you've lost the battle with bugs this season, you can win the war by planting flowers that insects find unpalatable. These flowers naturally repel insects due to soapy sap, succulent leaves, hairy foliage, and other natural defenses, meaning you have more time to devote to weeding, bouquet gathering, or just relaxing in the garden. Not to be confused with the annual pelargonium many people refer to as geraniums, the true perennial geranium is an option for gardeners from Alaska to Florida. Although you can choose from popular named varieties like 'Johnson's Blue,' 'Ann Folkard,' or the mysterious 'Dark Reiter,' horticulturists have not removed the desirable hardy characteristics from this unassuming wildflower. Plant in average soil in partial shade, and enjoy the ornamental divided foliage when flowers fade. The Russian sage is an indispensable plant for the sunny perennial border, attracting beneficial bees but offering nothing to browsing bug pests. This is due in part to a combination of a bracing herbal aroma, and tough, fuzzy foliage. Gardeners will appreciate the waving blue wands of foliage from early summer until fall on plants that need no deadheading, supplemental irrigation, or fertilizing. Pull up young runners in the spring to keep Russian sage in check. It's a wonder that the cheerful annual Melampodium divaricatum hasn't earned a rightful place alongside zinnias and marigolds as a favorite bedding plant. The plants are easy to start from seed, and they stay smothered in one-inch yellow blossoms all season. 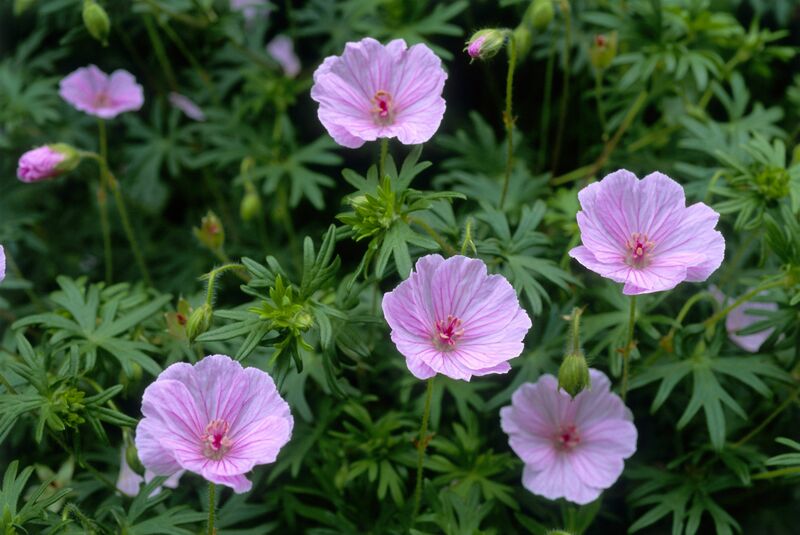 No need to save seed for the next summer's blooms, as these plants self-seed easily. All the bright green plants need is a location in full sun, and regular watering. Plant with equally easy purple gomphrena flowers for a low maintenance border or mailbox planting. If you have an area of full sun and well-drained soil, you have the opportunity to grow one of the most beloved perfume-yielding plants in the world. Both the leaves and flowers of lavender are fragrant, yielding material for cooking, potpourri, and bouquets. Although insect pests won't bother lavender, root rot and mold can plague this Mediterranean plant. Plenty of sun, raised beds amended with sand and gravel, and good spacing to promote air circulation will ensure that your lavender plants will return for many seasons. Agapanthus africanus, the lily of the Nile, has the kind of thick, strappy foliage that shrugs off insect invaders with ease. As a tropical perennial, the blue or white flowering plant will only come back reliably in USDA growing zones 8 through 11, but you can grow the plants from rhizomes in the container garden. Gardeners in mild coastal areas may use the African lily to control erosion on hillsides. It seems that insects abhor the spicy clove scent of cottage pinks as much as we love it. The perennial dianthus was born to thrive in the rock garden, as sharp drainage is an essential habitat feature for the success of this spring flowering plant. Try 'Firewitch,' named the Perennial Plant of the Year 2006 for its brilliant pink flowers that pop against blue foliage. Whether or not you like cats, you should include the famed Nepeta 'Walker's Low' in your perennial garden if pests are a problem. Not only does this blue-blooming hummingbird magnet deflect insects, but rabbits and deer pass it by as well. Try a pretty carpet of several plants as a companion planting in a rose garden.